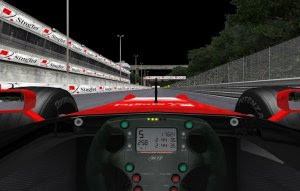 The SingTel Simulator is a sight, sound and motion simulator that gives you the experience of driving a real Formula One race car. Physically, the SingTel Simulator looks just like a Formula One car. It has the Singapore Grand Prix circuit loaded in a virtual software that is displayed on 3 LCD screens. Mounted on a motion-enabled platform, it allows the user to experience every thrilling hairpin turn, every heart-pounding skid, brake and crash while zooming down the actual Singapore Grand Prix circuit at breakneck speeds.